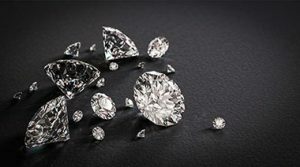 There are plenty of jewelers out there who offer quality diamonds, but there are also countless companies specializing in diamonds that are aesthetically pleasing on the surface, but which contain hidden or subtle flaws that even a seasoned observer who knows what to look for in a diamond may not spot. A diamond doesn’t need to be perfect in order to be valuable. You just need to know what you’re buying. Trained jewelers will certainly spot flaws. That may prove to be a problem for a diamond’s future value if you paid a premium for it. Knowing what to look for in a diamond is crucial to investing in a quality piece of jewelry. We’ll provide a summary of what to look for. You don’t have to be a professional to put these tips to use. Below, we’ll explore the most important characteristics to consider when judging the quality of the diamond. These characteristics are commonly known as the “4 Cs” of diamond quality. We’ll also discuss the shape and style of the diamond, as well as where to source ethical diamonds. Most diamonds sold in the world have very small flaws called “inclusions” and “blemishes”. They were developed in the diamonds as they formed underground. Inclusions are tiny imperfections inside the diamond, while blemishes are imperfections on the surface. These flaws can affect the brilliance (brightness) of the diamond. These flaws interfere with light as it passes through the stone. Diamond clarity is typically graded by an 11-point scale that was created by the Gemological Institute of America (GIA). The GIA is a well-respected and long-standing laboratory that developed the 4 C system of diamond grading. This makes it convenient to judge diamond quality. You don’t have to be an expert with a magnifying glass to know what you are getting. All you have to do is look at the clarity grade. Now let’s consider how the scale actually helps you determine what to look for in a diamond. A truly flawless diamond is graded FL (Flawless). 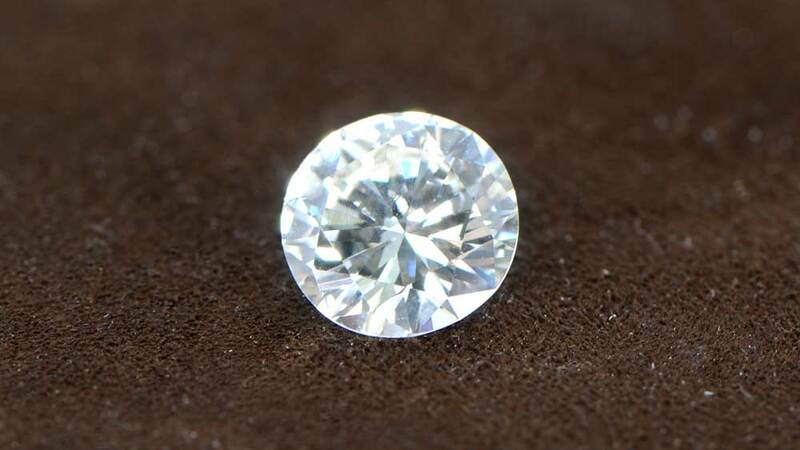 An FL diamond contains no inclusions or blemishes that can be seen under 10x magnification. From there the scale proceeds to IF (Internally Flawless), VVS1 and VVS2 (Very, Very Slightly Included), VS1 and VS2 (Very Slightly Included), SI1 and SI2 (Slightly Included), and finally I1, I2, and I3 (Included). Each grade contains more inclusions that are apparent at 10x magnification. Typically you can go all the way down to an SI1 and not be able to see flaws with the naked eye. If you fall below SI2 however, flaws will become more apparent. On the lower end of the spectrum, an SI1 is a great choice, especially on a smaller diamond. For those seeking out a higher quality stone, especially for larger pieces, a VS2 or higher is generally preferred. Click here for our complete guide to diamond clarity. How does Diamond Color Work? Color variations are a slightly less important characteristic to many buyers, but it is still worth considering. Typically, the closer the diamond comes to being seen as completely colorless, the higher its value. White diamonds are graded with the GIA color scale which designates a color tint of D to Z. The letter D designates a diamond as colorless, and Z designating a diamond with a light yellow tint. Diamonds do come in several other colors which are highly valued, such as pink, blue, and yellow. Colored diamonds tend to be graded on a separate scale, and are known as “fancy” diamonds. For a diamond to be assigned a color grade, it has to be examined in a laboratory setting which controls for both environmental tint and tint in the light source. Color is eliminated from all surfaces and light sources to accurately judge the diamond’s color. It is apparent from this process that a diamond’s color can be difficult to determine with the naked eye under normal circumstances. For the most part, if you choose a diamond with a color rating anywhere from D – J, your gemstone will appear largely colorless, which for many is what to look for in a diamond. Color is also important when it comes to choosing your setting. 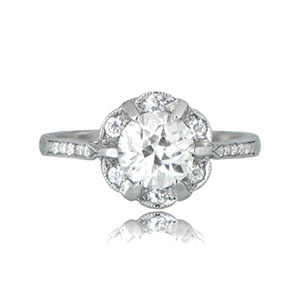 For example, a colorless diamond set in a gold vintage engagement ring will reflect the gold. This may be undesirable if you are looking to emphasize the colorlessness of the diamond. 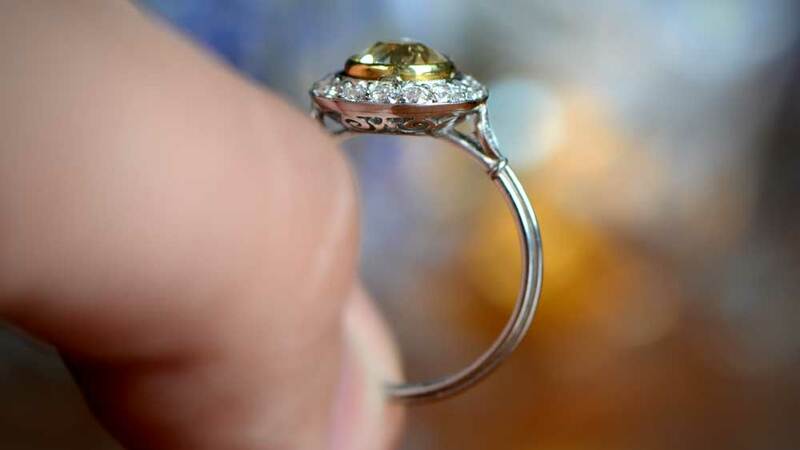 However, a diamond with a slight yellow tint will appear less altered in color when set in gold. The cut of the diamond has to do with the diamond’s symmetry, proportions, and polish. A diamond’s overall liveliness depends on these attributes. This is because a cut will determine how light interacts with the diamond. The “light” is described by a diamond’s fire, brilliance, and scintillation. The fire has to do with white light breaking down into the colors of the spectrum as it passes through the diamond. Brilliance is a measure of brightness, and scintillation has to do with how the stone sparkles. The cut stands as a useful indicator when determining what to look for in a diamond. This is because a cut grade takes into account a range of important attributes, combining them into a single grade that will tell you quite a bit about how beautiful the diamond is going to be. The 5 cut grades are poor, fair, good, very good, and excellent. An excellent grade means that a diamond’s girdle width, cutlet size, facet shapes and angles, polish, and symmetry are all situated so as to produce the greatest fire, brilliance, and scintillation in a diamond. The best gemstones demonstrate Very Good and Excellent cuts, so what to look for in a diamond that is shaped round is a cut that doesn’t go much lower than Very Good. For a differently shaped diamond or an antique cut diamond, a Good or even a Fair cut can sometimes suffice. 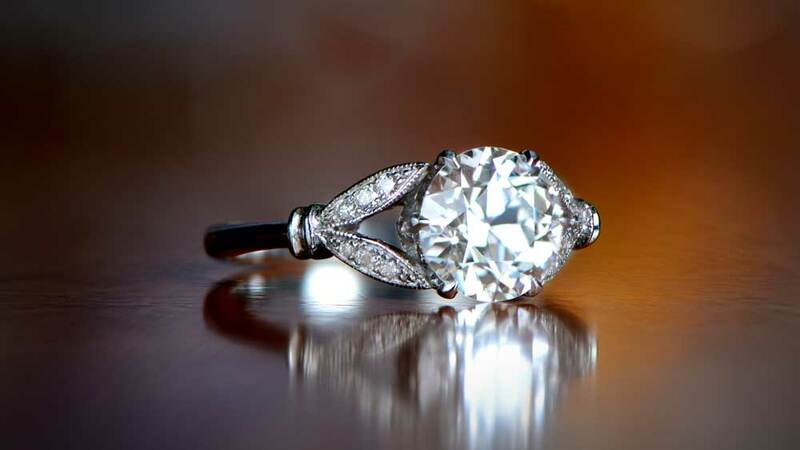 It is important to note that genuine antique diamonds won’t usually rank higher than good or very good. Diamonds cut earlier than 1950 were typically polished by hand and didn’t follow the modern diamond cutting guidelines. For many people seeking information on diamonds, the carat seems like a fairly straightforward characteristic to consider. Carat specifies the diamond’s weight: the greater the carat, the greater the size of the diamond. However, it gets a little more complicated when you are talking about how large the diamond will appear. When thinking about what to look for in a diamond, carat is a meaningful indicator if you are looking for a certain diamond size. It is important, however, to take other factors into account as well. The value of the diamond rises quickly as the carat increases, and there are other ways to achieve a diamond appearance that looks larger. For example, a diamond’s cut will affect how much of the diamond is visible. If the diamond features a deep cut, a greater proportion of the diamond’s mass is going to be hidden underneath it. 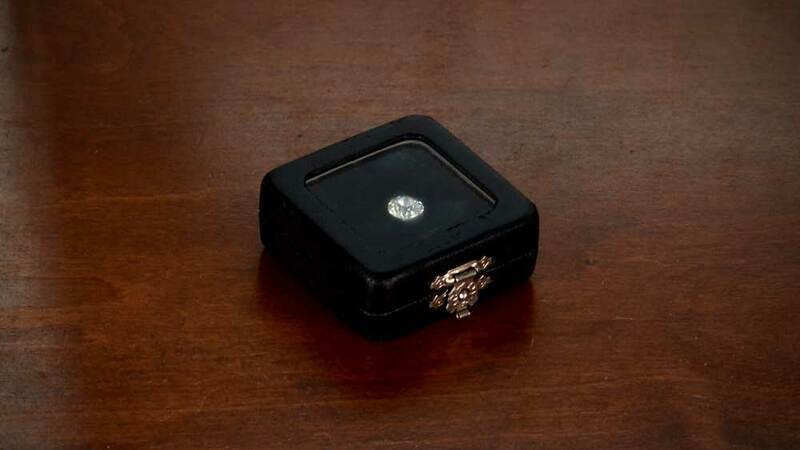 The diamond will have a smaller diameter, making it appear smaller on its face. A cut that features less depth and a greater diameter will make the diamond appear much larger, while you are still paying for the same carat, but you may sacrifice some of the diamond’s brilliance. Click here for an in-depth analysis of diamond carat weight. The shape is another important attribute to consider when searching for a diamond. Diamonds are cut in varying shapes. There are 10 common shapes that you will find in most diamonds. Even though each shape is a matter of taste. Different shapes appeal to different people. Each shape also affects a diamond’s brightness and fire in different ways. The shape can determine how much a diamond’s color, clarity, and size contribute to the overall beauty of the piece as well. Round cut diamonds are the most popular shape, and they are the most effective at reflecting light. Brilliant-cut diamond shapes feature triangular-shaped facets and come in popular shapes such as oval diamonds, marquise cut diamonds, pear-shaped diamonds, radiant cut diamonds, and heart-shaped diamonds. These types of shapes tend to make the diamond look larger. 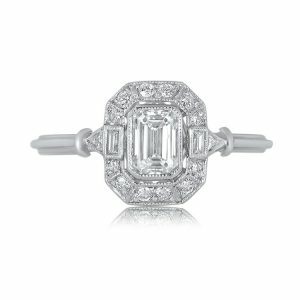 Other popular cuts are the Asscher cut, emerald cut, and cushion cut, which are more rectangular. Finally, the princess cut diamond is another popular shape for its versatility in various jewelry styles. For those who prefer antique diamonds, the Old Mine Cut, Old European Cut, Antique Cushion Cut, Rose Cut, and Asscher Cut are among the most popular choices. When buying a diamond, it is important to seek out ethically mined and conflict-free diamonds from responsible sources. Unscrupulous diamond companies and mines have been responsible for the financing of civil wars, human rights abuses, economic oppression, environmental degradation (in the form of deforestation and topsoil erosion), and a host of other calamities. Look for conflict-free and environmentally ethical diamonds. In doing so, you will be able to enjoy the dazzling beauty of your diamond for years to come, with the knowledge that you have helped contribute to healthy communities and environmentally safe mining practices around the world. Buying antique diamonds, like the ones that we collect at Estate Diamond Jewelry, offers a conscious alternative to conflict diamonds or indirectly supporting environmental damage. Please note: All the diamonds at Estate Diamond Jewelry are guaranteed to be conflict-free. They all originate from pure and ethical sources as defined by the Kimberley Process. To read more about the Kimberly Process, click here. We understand that the size of a diamond is often an important factor in many customers’ eyes, as it is a visually distinguishable marker of a diamond’s value. However, when determining what to look for in a diamond from a value standpoint, all of the diamond’s attributes affect each other. You should carefully weigh these attributes against one another to find just the right balance for your budget. If you want a larger diamond but are still restricted by cost, consider lowering the clarity. We don’t recommend going much lower than SI1. Furthermore, you should exercise caution, as the higher the carat, the more apparent imperfections will become. A diamond’s color also becomes more apparent as the diamond grows larger. The quality cut will allow the diamond to reflect more light, making the color more difficult to notice. 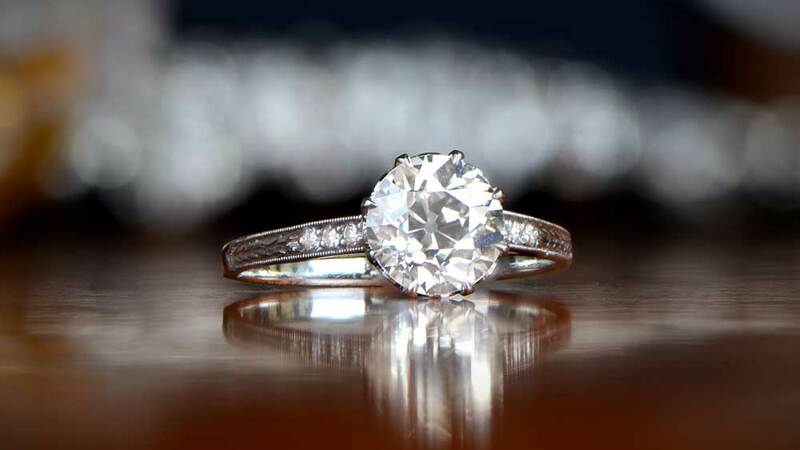 Furthermore, a shape like the marquise cut can also cause the diamond to appear larger than it is. 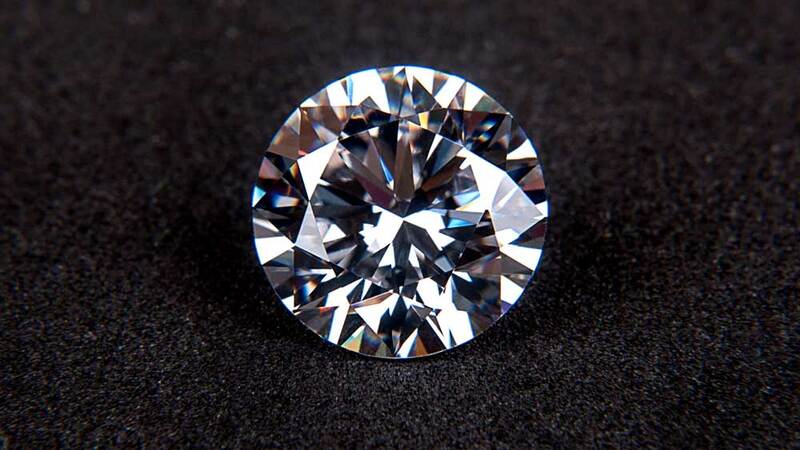 This illusion improves the apparent value of the diamond to the wearer. The shape and cut of the diamond can also affect how the clarity comes across. Brilliant-cut diamonds such as round, oval, princess, cushion, pear, and marquise diamonds are better at hiding imperfections. Step-cut diamonds, like Asscher and emerald diamonds, show imperfections more vividly and we suggest to go for a higher clarity. Determining what to look for in a diamond means taking all of these elements into account. By doing so, you will be able to settle on a diamond that you can fall in love with. Even with a solid knowledge of the 4 Cs of diamond quality, engagement ring shopping can be difficult. That’s why people shop at our online store. We help our customers along the pathway to find the perfect ring. Furthermore, if you are looking for ethically sourced diamonds, you can shop through our collection with the confidence. At Estate Diamond Jewelry, we have been offering high-quality estate jewelry for more than 30 years. Our standards are without compromise. If you’re looking for a truly exquisite diamond, we invite you to explore our breathtaking selection today.